The next change-over will be on Tuesday, MAY 9, 2017. If you are interested in exhibiting, an advance email, on or before Wednesday, MARCH 8, to Christine Gendron, christinegendron@sympatico.ca, indicating the number of works and their sizes, would be helpful. Or, just show up at the date, but risk being turned away. We look forward to seeing exhibitors on Tuesday, MARCH 14, 2017. On Tuesday, March 7, 2017, please retrieve the works that are currently hanging and/or bring in new paintings (or other two-dimensional art) to the Orleans Library. These new pieces will be hung until May 9, 2017. The changeover at the Orleans Library is between 10:30 a.m. and 11:30 a.m.
We look forward to seeing exhibitors on Tuesday, March 7, 2017, at 10:30 a.m.
Where: Blackburn Hamlet Branch of the Ottawa Public Library, 199 Glenpark Dr. Ottawa K1B 5B8. 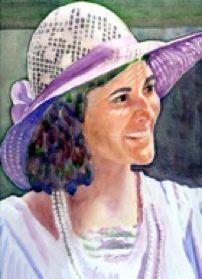 The Blackburn Library, in conjunction with Arteast, is proud to present Friends and Relations, an exhibition of watercolour portraits by Marion Jean Hall. Marion’s affectionate portraits of friends and family members express her interest in human individuality at all stages of life. This show is a unique opportunity for the public to enjoy, encourage and support local artists in their community as well as engaging with the Blackburn Library. For the eighth year, PAA members will open their doors to visiting artists in order to host a week of making art together and to showcase our stunning region. We will gather on Monday morning, July 17. This will give you an opportunity to meet your hosts before heading out to our first activity. Your host will provide you with bed and breakfast, and a picnic lunch for the duration of your week. Dinners will be restaurant or potluck events. Each day is comprised of group activities, and may include a workshop, sharing of portfolio or technique, or an opportunity to create “en plein air” in one of our picturesque locations. Time is allotted to complete works at the Stone School and to share a meal and social event together. There will be an Exhibition of work created during the week and a Vernissage which will be hosted on Friday at 4 p.m. The week is provided at a nominal fee of $200 by PAA members. This includes accommodation, meals, and specialized materials for certain art activities. You will need extra money for any occasions where we eat out. Pour la huitième année, l’AAP accueille des artistes de l’extérieur pour partager une semaine de création et d’exploration des fabuleuses richesses du Pontiac. Votre arrivée se fera le lundi matin, le 17 juillet où vous rencontrerez vos hôtes pour une première activité. Chaque artiste sera jumelé à un artiste local qui vous offrira le gîte et le couvert pour la semaine. Les soupers seront pris en commun pour festoyer le soir après les activités. Chaque journée donnera lieu à des projets de groupe : ateliers, partage des expériences et des techniques, excursion vers un site pittoresque, création en plein air. L'École en pierre est à notre disposition pour y compléter les œuvres, partager un repas et socialiser. Une exposition montrant les résultats de notre travail de la semaine et un vernissage auront lieu le vendredi à 16h. Cette semaine vous est offerte à un prix nominal de $200 par les membres de l’AAP. Ceci inclut : l’hébergement, les repas et tous les matériaux utilisés pour certaines activités d’art. Vous aurez besoin de l’argent en surplus pour des repas qui seront pris à l’extérieur à l’occasion. CPAWS-OV will be hosting our first annual Dumoine River Art Camp from August 2-7, 2017. The Art Camp will bring together artists working in different mediums and from communities across the Outaouais region. We will explore the Dumoine River, create works of art, share stories, and become inspired by this magnificent landscape. Next winter, we will hold two art shows to display the works derived from this art camp. One show will be located in the Pontiac region to highlight the beauty of their own backyard and the other show will be in Ottawa to reach a wider audience. We will host an artist’s evening and Fundraising Gala during the Ottawa showing. To learn more about CPAWS-OV Dumoine River Art Camp, CPAWS-OV's campaign to protect the Dumoine, or any of our upcoming events, please visit our website. Interested in volunteer opportunities? We may have a project for you! Contact Jesse Lever at jlever@cpaws.org to find out more. Make it in March Sale!